There are a lot of diamonds in the world. More than most people are aware of. They’re not quite as rare as popular culture makes them out to be. And yet, there are diamonds and there are diamonds – if you know what I mean. Some you can pick up for a few hundred dollars. Others are priced in the millions. 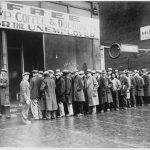 Now, an article about the cheapest diamonds would be boring and long. (Susy from the corner store has a half carat diamond earrings, Donald has one stuck in his nose). Far more interesting are the expensive ones! The original Cullinan diamond was a whopping 3106.75 carats, which – as a carat is a fifth of a gram – made it 621 grams. That’s nearly 62 ounces! Unfortunately, it doesn’t exist anymore. 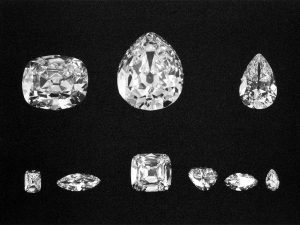 Instead, it was cut into many smaller diamonds – most famously the Great Star of Africa (530.20 carats) and the Lesser Star of Africa (317.40 carats). Both of these diamonds are a part of the English Crown Jewels. We can’t give you a price as these diamonds haven’t been bought or sold. Instead, they were gifted to the Crown. But you can be sure they’d be worth a bundled. After all, the great star is the biggest diamond in the world and the lesser star is only a few positions behind it. The story of the Koh-I-Noor goes back 800 years, to the year 1302. Supposedly, its first owner was a local Persian Shah (In Persian, Koh-I-Noor means ‘mountain of light’). 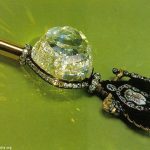 At the time it was 793 carats, or about 5 ½ ounces. It had a very bloody history, with many owners dying as it went from hand to hand across South Asia. Finally, it ended up in British hands (who else?) when they conquered Punjab. The British royal family believes the stone is cursed. And so, the men of the royal dynasty refuse to wear it. Only women are supposed to do so. Of course, most of the time nobody does. Instead, it’s only displayed in the Tower of London. Note that the cut you see here is ‘only’ 104.6 carats, or 21.12 grams. Prince Albert ordered it cut, as he thought the original stone wasn’t pretty enough. Again, as it hasn’t been sold, we don’t know the price. It’s somewhere between ‘a lot’ and the GDP of a small country. 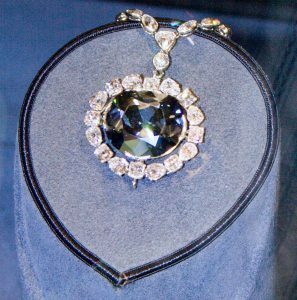 Possibly the most famous diamond in the world is the Hope diamond. They found it in India almost four centuries ago, when it was named Tavernier Blue. Since then hit has been recut and renamed several times, until it reached its current size, fam, and name. It is 45.52 carats. A lot of people have owned it, including King Louis XIV and Evalyn Walsch McLean. In 1791 it was stolen and disappeared for nearly 100 years. Then it re-emerged a little smaller and with a different name. It was given to Washington’s National Museum of Natural History in 1958. You can still go see it there today. It is currently insured for a whopping 250 million dollars. 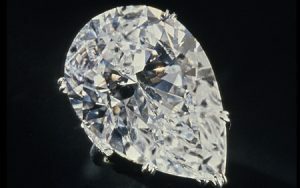 This 68 carat diamond was indeed named after Richard Burton and Elizabeth Taylor. Good job if you knew that! There have been several other owners, including Cartier and Robert Mouawad. The sale price of 1,050,000 by Cartier in 1969 was a record at the time in open auction. The next day it became a little bit more valuable. Richard Burton – who had been bidding against Cartier – bought it from them for 1.1 million. Later, when Elizabeth Taylor got divorced from Richard Burton, she sold at somewhere between 3 and 5 million dollars to Henry Lambert. She used part of that proceeds to build a hospital in Botswana. It passed from Henry Lambert to Robert Mouawad in 1980. He still holds it today. 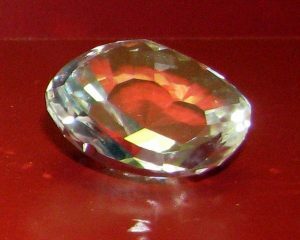 The Incomparable Diamond was found in 1980 in the modern-day Congo by a little girl playing in rubble that had been rejected by the nearby MIBA diamond mine. It weighed 890 carats. Sounds to me like somebody lost their job that day! The original stone was highly irregular and had a lot of cracks and problems. 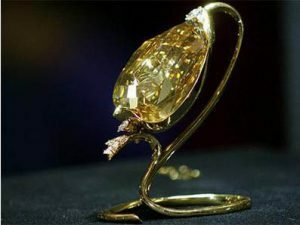 The owners wanted it to become the biggest diamond in the world, but ultimately it had to be cut down to the third-biggest, at 407.48 carats, to show the stone in its best light. 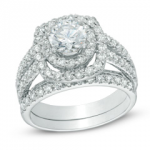 In 1988 a bid of 12 million was placed on the diamond in open auction. 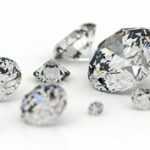 Five of the world’s most valuable diamonds! Interesting stories, right? 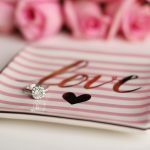 Now, if you have a diamond that you’re interested in selling then check out our diamond buyer reviews. You might not be able to get these kinds of prices, but it could still make you a bundle. And who knows? Maybe whatever stone you have has a history attached to it too. Though even if the human story is no more exciting than ‘It was bought by Danny for Christie’ that shouldn’t really matter. It is still a diamond. That means it is older recorded written history by a factor of about 1000. That in itself is already pretty amazing. 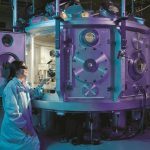 This entry was posted in Diamond Value and tagged Diamond Values, Expensive Diamonds, Famous Diamonds, The Cullinan Diamond, The Hope Diamond, The Taylor-Burton Diamond.